The bears are very well made and are so cute! I'm sure my grandson is going to love it! Our embroidered plus Superman Teddy Bear makes the perfect sidekick for your little Superhero. This Superhero Bear will be embroidered with any name in yellow thread on the back of the cape. 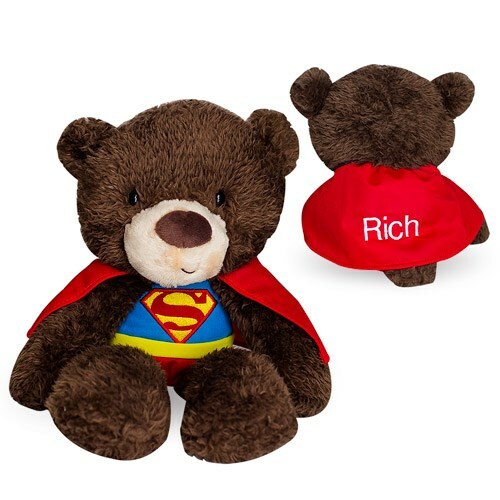 Personalized Super Hero Stuffed Animals makes great gifts for birthdays, get well or any other occasion. Additional Details Take a look at our entire collection of Embroidered Plush Animal Gifts, from 800Bear.com. Any gift you choose will become a treasured keepsake enjoyed by all.